I often think about Rembrandt and what he didn’t have. He didn’t have central heating, for example, which is why he depicts himself bundled up all the time. It was cold in Amsterdam much of the year. He also didn’t have electric lighting to extend his work day. He painted by candle light. Imagine that. 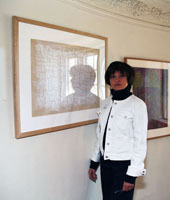 He was also a printmaker and did that without paper towels. He had assistants, but still, imagine that. Rembrandt didn’t have paper towels and he didn’t have aquarellable pencils, either. He was a tireless experimenter and I’m sure if had had aquarellable pencils he would have used them. One of my students caught the bug and has been working with the Stabilo to great advantage. 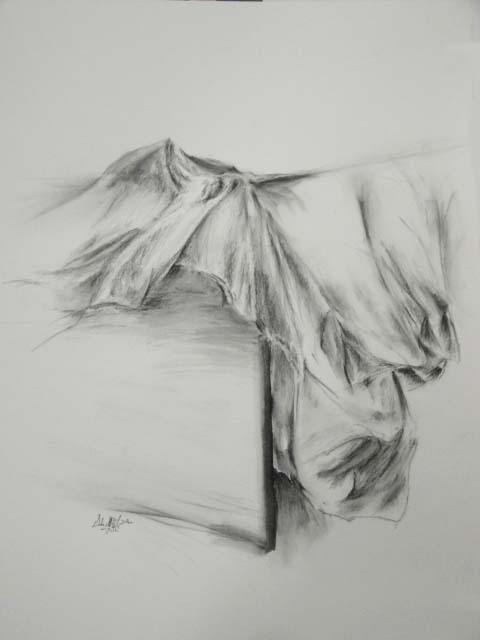 Shown above is Gabrielle E.’s drapery study from last week’s class. The soft edges and blending effects are created with the sweep of a damp paper towel. Art materials don’t have to be “classic” or expensive. Forget bona fide art supplies. Draw with a twig, a blade of grass, a shish kabob stick, the end of a used up brush, a paper towel; paint with a housepainter’s brush or a kitchen sponge. Rembrandt used something called a reed pen, which at its finest was made of bamboo, but could also be a homemade tool made of indigenous reeds that grow near rivers and ponds.